Do you want the size of your pics perfectly to fit for forums or blogs in a second? Right now you have got Resize Now for Mac! Import the pictures, enter the limited size of forum, and leave the rest things entirely to Resize Now. Resize Now is to batch resize pics as forum requires and maintain their quality. ...... No doubt it is so annoying to batch resize various pictures. Are you still in the trouble of batch modifying the size? If so, go for Resize Now, which is designed to totally solve such problems. Unlike full-function image editor softwares, Resize Now takes much less computer storage space and runs much faster. Moreover, by using Resize Now you can make your pictures as you want without professional skills. Well, come to try Resize Now! Resizes and convertes graphic files (JPG, TIF, GIF, PNG, BMP) in batches. Picture Resize the right choice for resize pictures. Batch convert, resize optimize images photos and jpegs. 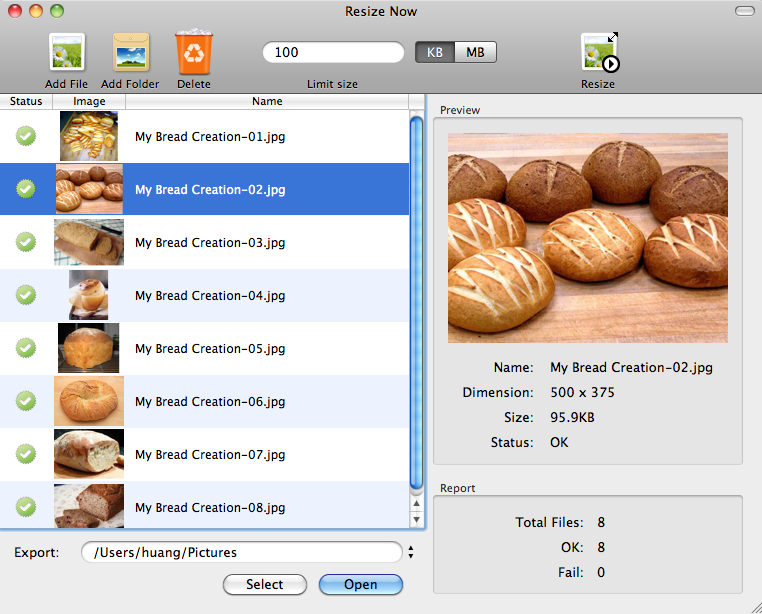 Easily resize pictures in batch mode and convert the bmp files to jpg files. Qweas is providing links to Resize Now for Mac 2.2 as a courtesy, and makes no representations regarding Resize Now for Mac or any other applications or any information related thereto. Any questions, complaints or claims regarding this application Resize Now for Mac 2.2 must be directed to the appropriate software vendor. You may click the publisher link of Resize Now for Mac on the top of this page to get more details about the vendor.